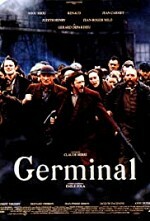 Watch Germinal: It's mid 19th century, north of France. The story of a coal miner's town. They are exploited by the mine's owner. One day the decide to go on strike, and then the authorities repress them.